On Thursday evening, Sergio once again talked me into “finding the party” and this time I was awake enough to join him. On our way out of Deco Walk Hostel we bumped into another of his friends; Corstan, a German IT Developer who had taken a three-week holiday on the East Coast, who decided to come with us to grab some pizza. Corstan had been out with Sergio the night before and couldn’t face another heavy night boozing on Ocean Drive. On crossing a road, Sergio bumped into yet more friends; Nik and Ingrid from New York, who after a little hesitancy amid claims of “too much pizza” decided to also decided to come with us for food. I got talking chatting with Nik, who told me the four of them had previously decided that they were going to rent a car and drive to Key West on Friday and that they needed another person to fill the car. There was only one thing I could do; agree immediately. Nik told me the plan was to pick the car up at 07:30am, at which point I encountered a few doubts about partying with Sergio. At the time, Nik convinced me he would be out tonight as well and that we could sleep off the hangover on the way. Sergio and I left the others to go to the Miami Beach International Hostel, where we bought tickets for a keg party that was due to start at 10:00pm. 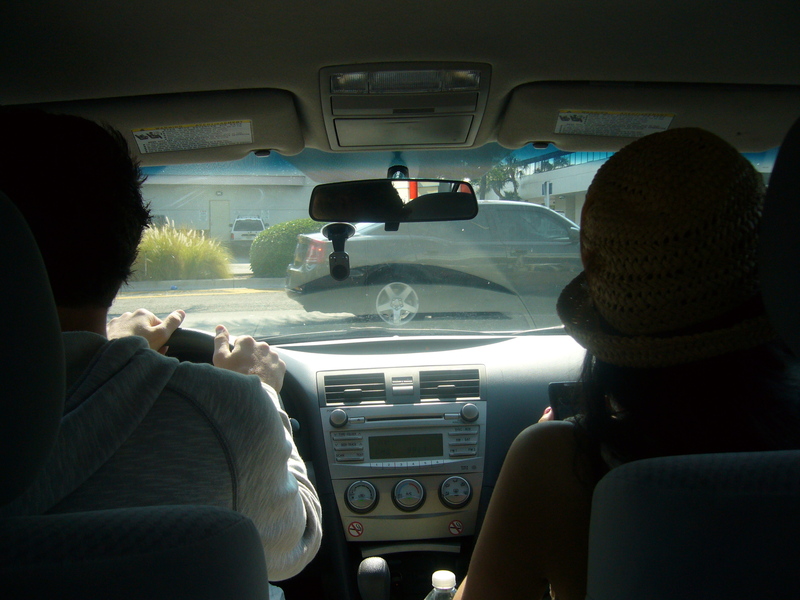 Moments before it began, Nik came in and decided he wouldn’t join us as he had decided to do the driving to Key West. The time rolled on, the keg was brought out and I had hoped for red plastic cups, but unfortunately we had to make do with polystyrene. The staff let us know that between 10:00pm and 11:00pm the rules were “all you can drink”, and Sergio and I matched each other for five while we got to know some of the other hostel guests. At around 11:30pm the aptly named Party Bus rolled around the corner, bearing tinted windows, neon lights and podiums inside. We all got on board and headed to one of the clubs to continue the night. One of the Australians I met leaned over while I was at the bar and whispered in my ear “She wants to marry me, she just doesn’t know it yet.” while motioning towards one of the dangerously good-looking bar staff. At around 01:30am after many more beers and plenty of attempts to dance, Sergio and I left the club to head back to the hostel. Something that I like about Miami, and perhaps all of America is the grid system layout of their streets, which makes it incredibly easy to navigate. Back at the hostel we both quickly settled down for as much sleep as we could grab before our early start. The following morning, feeling slighty groggy, Sergio and I got up and met Corstan for breakfast before heading over to the Miami Beach International Hostel to meet Nik and Ingrid, who had made reservations to pick up a car. It only occurred to me on our way back to Miami from Key West that it was in fact Friday the 13th. I’m not superstitious but we had a pretty hefty share of bad luck before we managed to pick up the car. Firstly; Nik had made reservations from an Enterprise Car Rental on the other side of South Beach, they informed us we should try the local branch to save the trip. Unfortunately, no cars were available, so we tried to sort out a taxi for five that would take us to the original rental place. Secondly; we eventually squeezed into a taxi for four and began on an impromptu city tour, going completely out-of-the-way of the rental location and ending up even further from our destination than planned. Eventually, the taxi driver realized that we did actually have plans for the day and found his way to Enterprise. We picked up the car with no problem, went to fill up with petrol to find the first station had no “gas”. After we eventually filled up, Sergio set up his GPS to take us to Key West, which lead to the third and final piece of bad luck; his GPS would only take us to the Airport. Following from this, the rest of the day was spent reminding each other that it’s not about the destination, it’s about the journey. Clichés are fun, right? Eventually we made it out of Miami and onto Highway 1. The first highway in the U.S. I don’t know if this means it was the first one ever, or it’s just the first one they got round to numbering, but it’s number one! The road ahead was long, and we drove for several hours, all getting to know each other better. Listening to Sergio and Corstan talk was humbling, both using English as a second language and communicating with what appeared to be ease as they claimed that their limited vocabulary made things difficult. 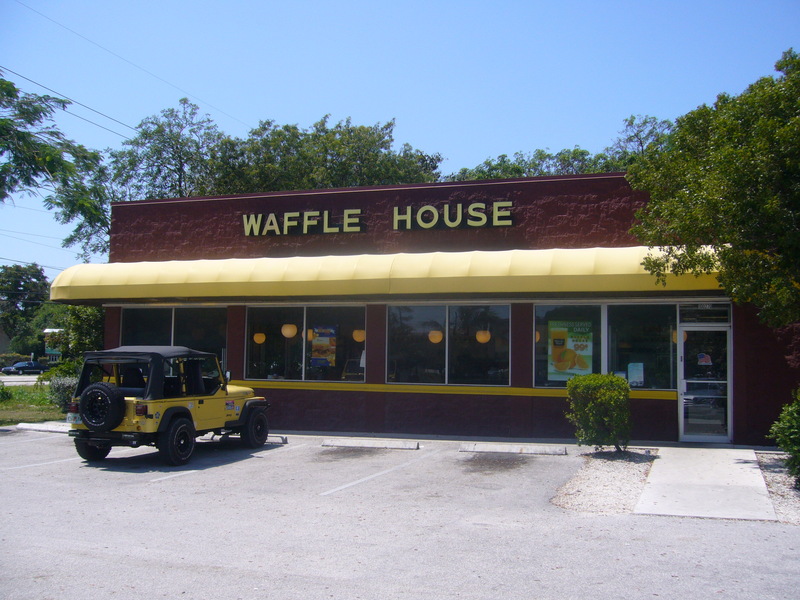 We took a break for food at a Waffle House, which was my first real experience of the American diner. The food was alright but what I enjoyed the most was the size of the drink. If you order a coke, you get a pint, unlike in Europe where you would get a single measure. As we headed back to the car, I stopped off to use the toilets. As I approached the car, my new friends demonstrated their brilliant sense of humour by driving off. However, they quickly saw the error of their ways and stopped to let me in as we continued our drive. 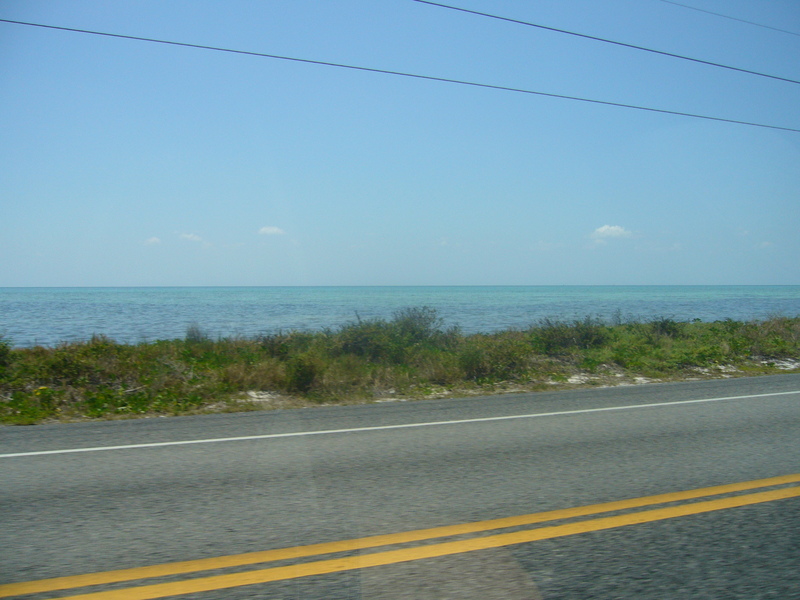 As we approached the Keys, the scenery around us turned from monotonous to incredible. Whenever there was a break in the tree line, we could see clear blue waters, white sands and emerald isles scattered throughout. 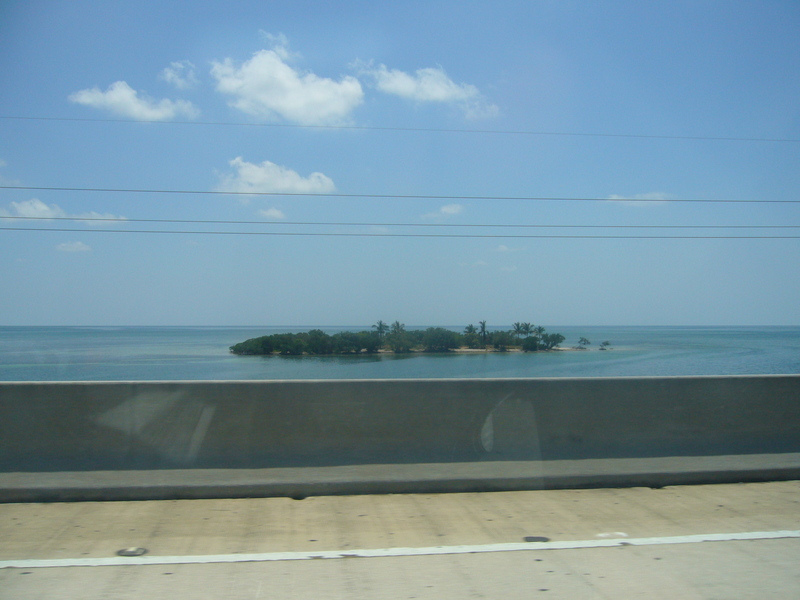 Between Keys were long bridges, which allowed for incredible views over the surrounding seascape. We had been travelling for a couple of hours before we started to talk about what we wanted to do, the best suggestion, of course, being to swim 90 miles to Havana for a mojito. 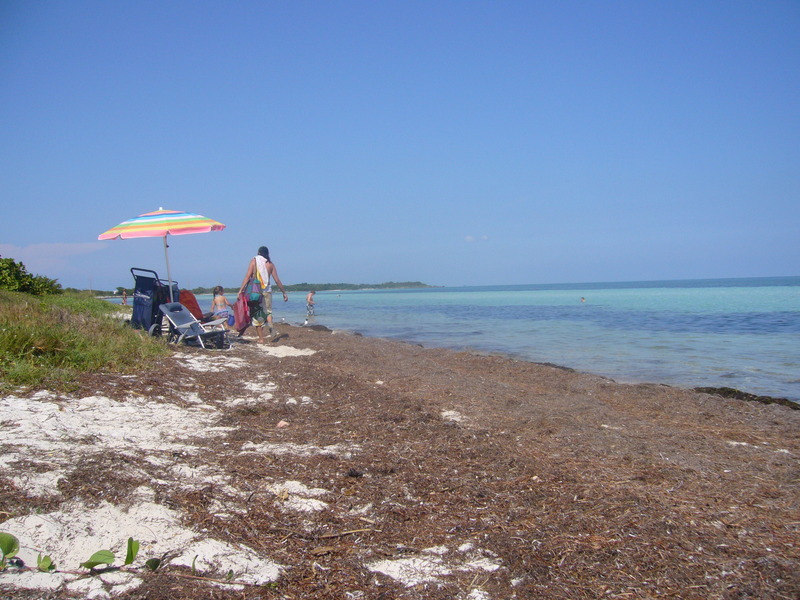 In the end, we decided that it might be too far for one day, and settled on stopping at what the Internet claimed to be “Florida Key’s best beach” at Bahia Honda State Park The beach itself, wasn’t much to write home about, but the ocean lived up to the hype. Shallow, clear and surprisingly warm water covered a mix of coral white sands, sea grass and broken coral and stones. Corstan and I acted out how you entered the sea in Europe, taking tentative steps and standing, shivering while small waves broke over us. Following our dip in the sea, we chilled on the beach, getting to know each other better and sharing stories from home and breaking cultural stereotypes. Once more we took to the sea, laughing as we asked to see Miss July and Miss October, as Ingrid got Nik to take pictures of her in the water. After another couple of hours chilling in the sun we decided it was time to make a move. The five hours on the road were well worth the four hours we enjoyed on the beach. As is often the case with new friends abroad, offers to visit, and places to stay if ever you were in the area were passed around and after Nik and Ingrid found out I was heading to New York they started listing all the places that they had to take me to and I was looking forward to seeing them again.